At the weekly Tuesday Market in Northampton, MA, I have a stand under a tent where I sell our farm raised lamb. Northampton is a very busy town. It is the home of Webs/Yarn.com and Northampton Wools (just down the block from the market) for all you knitters reading. Smith College is located there as are 4 other colleges that are close by - Mt. Holyoke, UMass, Amherst College and Hampshire College. Noho, as it is sometimes called, has a bit of an alternative vibe to it and many, many folks are vegetarians. It's a crap shoot trying to sell farm-raised lamb in a vegetarian town - I never know how I will do or who I might meet. I go every week. It is a day off the farm for me and out of my regular routine. Some days are good, some not so good, but I have to show up. Each week, I bring a project I am stitching to help pass the time. It's amazing how just stitching on brightly colored fabric will open up a conversation with a passerby. Most of the comments are something like..... "I used to do that when I was a child." "My grandma used to stitch." "That is so beautiful." "I could never do that." It makes me feel good to build a project over the weeks and have something to keep me sane when no one is loving and buying our lamb. Sasha was so enthusiastic and wanted to learn to stitch. I invited her behind my table and taught her running stitch on some extra wool felt I had in my box of tricks. She had sewn some before and picked it up quickly. Next we moved onto chain stitch. Sasha was amazingly quick and smart and funny. I could tell she "has it in her fingers." We sat stitching and chatting - the two of us. Sasha's Mom, sister Lola, and Sasha have come to the market every week since. At around 3:15, when school lets out the Tuesday Market starts filling up with kids and families. It is a very active place - with the flavored Shaved Ice being the biggest seller. Just after 3 p.m. each week, Sasha runs up to me, slips behind the table, and gets to work. I'm waiting for her to get bored and move onto something else but not yet. 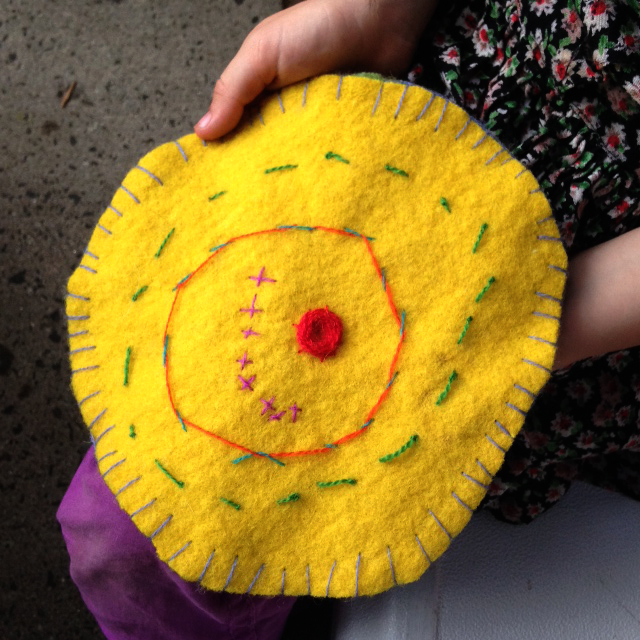 In the first 3 weeks, Sasha learned Running Stitch, Chain Stitch, French Knots, French Knots on Tails, and Whipstitch. She renamed french knots on tails as TADPOLE KNOTS. Aren't kids imaginations awesome? Sasha finished this potholder in 3 weeks of market stitching time. When I saw Sasha the week after she finished the potholder, I asked her what she did with it. She said she sold it to her Mom for $6.00. Gotta love it. Here she is - proud as punch with her 3 week potholder project. 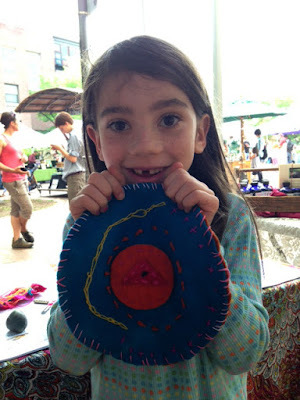 Last week, Sasha made an entire potholder in one market session. She learned Spider Web, Whipped Running Stitch and Blanket Stitch. Here it is. If you ask Sasha what her favorite stitch is, she will say Cross Stitch. When she was just about ready to leave, she told me she wanted me to have the yellow potholder. Thank you Sasha! I will treasure it always. Can't wait to see you next week. If you want to teach a young friend of yours embroidery this summer, I have a limited number of my 2004 hard-cover Kids Embroidery books for sale on my website. I'll be happy to sign one to your gift recipient. Here's the link to the page. You could also add a pack of my "Some of Each" Crewel Wool assortments to make a nice little end of school year gift for one of your favorite students. Crewel wool is very forgiving and I highly recommend it for teaching kids to stitch. 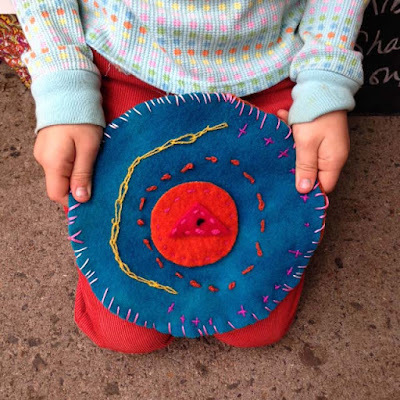 Help me spread the Embroidery Love and pass on the art of Crewel Embroidery to the younger generation! And Sasha - I will see you next week. I'm on my way to Boston to teach STEEKING and EMBROIDERY ON KNITS at Stitch House in Dorchester Saturday. There are still spots available. Here is the link for more information. I've heard such good things about this store - I cannot wait to meet the staff and customers and see all they offer. It is one of those stores that sells both yarns and fabrics so it will be a feast for the senses. Hope to see some of you blog readers there. 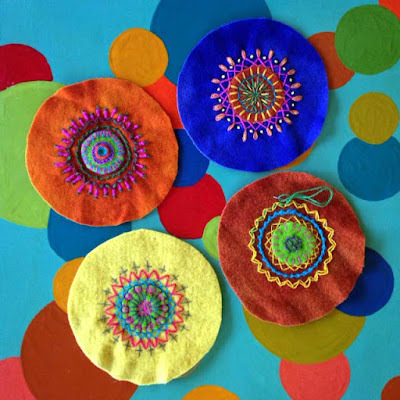 Embroidery is a great craft to do in the summer months because it is so portable and will not get you over heated like knitting can sometimes. Besides - you can teach friends too. What a fun way to spend a summer with a child or grandchild - both of you learning to stitch via my on-line Craftsy Class Stitch It with Wool! Check it out here. What a great story!! I am a cancer survivor, and one thing I've learned since my diagnosis is that there are many people who appear in my life who are "angels" to me. You are an "angel" in this girl's life, and so generous to share your talent with her. I love it when we have a positive influence, however small, in someone else's life. What a great story. It's wonderful that you cannot help being a teacher no matter what you are doing (although I'm sorry the lamb selling is not keeping so busy). I'm attempting to teach my grand-darlings yarn and thread skills and it's more challenging than I expected. Part of the challenge is that they are so very good at mimicry. Normally this would be good but they are right-handed and I am left-handed. Trying to tell them to use their best hand works for about 1 minute and then they are back to trying with their left. For the time being, I've decided to proceed with knitting and crochet (yes I crochet right-handed because that's how I was taught) and back off of the needlework because I'm afraid I'll "mess them up." How would you recommend someone in my shoes proceed? As a lefty, I loathe it when people tell me to "simply reverse" a stitch pattern and I never want to inflict that on anyone else. What a great story! It's wonderful to share our talents with someone who is so eager to learn and enjoys it so much. You are making memories that she will remember her whole life. Actually, it's refreshing to see someone her age these days sticking to it for so long with needlework in hand rather than some "device"! Who knows, perhaps she'll start a "trend" with her peers..? -- You'll have to get her started on a proper "sampler" next! ~ How wonderful to have Market Handwork Lessons! * Hello, Sasha * you are terrific at handwork ! ~ beautiful color choices. I can't wait to see what else you create with Kristin. I too just love teaching Handwork to children. 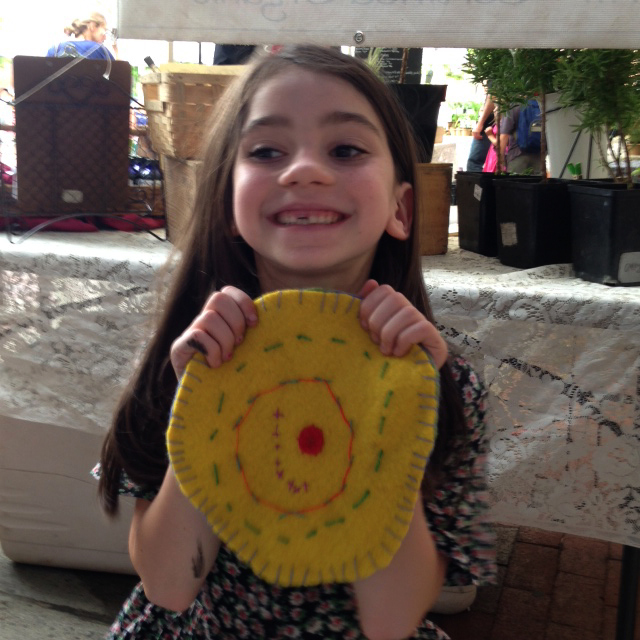 What a great experience for Sasha, to meet such an inspiring teacher at the Farmer's Market. ~ p.s. Who won Rebecca Ringquist's book ? Shell - A reader named Sandra Licher.